Fire is an important and natural part of the landscape in northern Australia and is a very important aspect of being a land manager. Often in the Darwin rural area and beyond there are many dry season fires, these are labelled as “uncontrolled”, “wild” or “non-prescribed” burns, but are more often than not actually lit on purpose by humans, and sometimes by accident or carelessness. These later dry season burns, or repeated “any season” burns are detrimental to our wildlife and the diversity of species within the native landscapes. Very often the fire services “back-burn” these fires to control the spread of them in the least amount of time, it is arguable they could be other ways to prevent their spread, but would be more time consuming and require more monitoring. There are however various burning regimes that will prevent undesirable hot and late fires and can sustain biodiversity. Burning regimes take into account the size and shape of areas burnt, the frequency of burning and the timing of burning. Many studies show that less frequent burning increases biodiversity and it is preferable to burn in was in known as a patchwork burning technique, carrying out prescribed early burning on different patches of bushland each year, so that some habitat remains unburnt as refuge for wildlife. These techniques are usually done on larger tracts of land, particularly those with boundaries to roads, prone to arson or accidental fires. On smaller areas of land (for example 5 and 20 acre blocks) fire breaks and preventing hot late fires is essential to preserving infrastructure as well as ecosystem integrity. A fire management plan that keeps out fire completely is usually preferable. Eventually canopy cover will increase and reduce the grass ratio (which is the fuel layer). If a cool fire is desired to prevent later “accidental fires”, it is best to keep this to only a small area, even on a small block and to only burn the same area after several years. Nearer to Darwin The Northern Territory Fire and Rescue Service (NTFRS) is involved with fire management, fire abatement and prescribed burning. The area they cover is generally the more built up area and they have a dividing line which is West of The Howard River and to the north. Bushfires NT are a good source of information in the Top End rural area. their management area covers most rural and remote areas of our region. Bushfires NT exists to help protect life, property and the environment from bushfire and is the lead government agency for rural fire management in the Northern Territory. 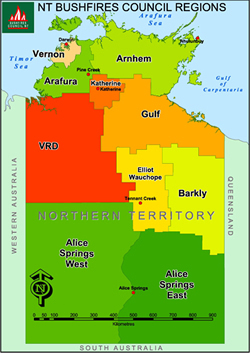 Under its jurisdiction, there are six fire control regions in the NT (see map). Bushfires NT’s primary roles are to administer the provisions set out in the NT Bushfires Act and support Territory landholders in fire mitigation and management. The Bushfires Council NT is a statutory body established by the Bushfires Act. Its role is to advise government on measures to prevent and control bushfires in those regions. Bushfires NT also supports some 500 active volunteers in 22 Volunteer Bushfire Brigades across the Northern Territory by providing training, vehicles and operational funding. There are Bushfires NT offices in Darwin, Batchelor, Katherine, Tennant Creek and Alice Springs. Find contacts for each office.